It was a bit of a nail-biter toward the end, but Arturo Morales of Costa Rica won the CPT Punta Cana and walked away with $44,494. Pura vida! Our Daniel Montagnolli went pretty far, but sadly, none of the Living the Dream guys made it to the final table. Daniel went into Day to in 8th place with 85000 chips but ultimately placed placed 26th. He pocketed about $1700 which he most likely blew in Punta Cana nightclubs before he returned to Austria. His trip was paid for by an online poker site where he won a satellite tournament, though, so… c’est la vie. Part of what made CPT Punta Cana an interesting event were the other events happening at the same time: the World Swimsuit Finals and its parties for starters. 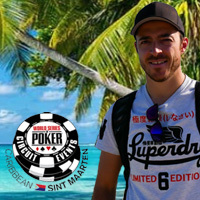 The 500K Punta Cana Classic, running concurrently, also added to the excitement. Venezuelan Luis Yapez won that event, taking home $171,000. There were also lots of other events with two to three hundred dollar buy-ins – plenty of opportunities to take advantage of what Daniel thought was a pretty soft field. We’re already looking forward to coming back to Dominican Republic for CPT Punta Cana 2016. All-inclusive packages are available through the CPT Punta Cana website. To find out about upcoming online satellite tournaments where you can win your way to a live tournament, check back here or like the Living the Dream Facebook page. Two Living the Dream team members made it through to Day 2. Who's still in the game?! Was a massage, a steak a nap or a pool party the best way to prepare?! Watch this episode -- and then come back tomorrow for the final results of the CPT Punta Cana tournament. So far all we've done is sweat -- but Main Event begins manana! Most of our group arrived in Punta Cana yesterday, the others arrive tonight in time for the CPT Punta Cana Main Event that we came to Dominican Republic for. In today's video, Steve, who won his way to the Caribbean by winning an online satellite tournament, gives his first impression of Dominican Republic, the Hard Rock Casino and the CPT. Tomorrow we'll have a re-cap of today's events.